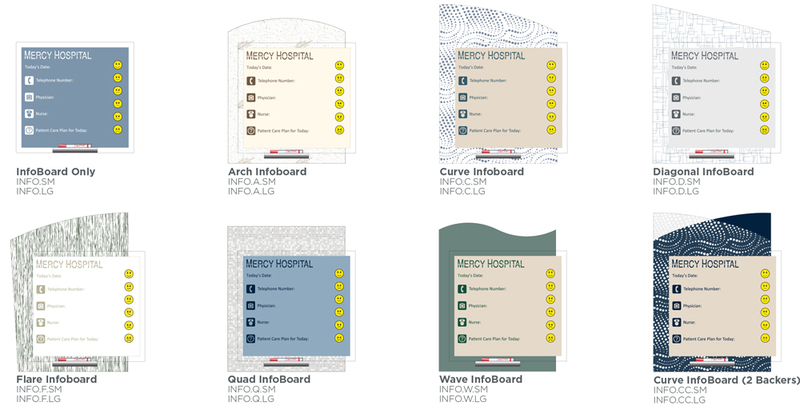 Welcome to 2/90 Sign Systems!InfoBoard Support | Welcome to 2/90 Sign Systems! Choose from 8 standard shapes. Available in 13 configurations with over 20 patterns and unlimited colors and materials to complement any environment. Template can be enhanced with one or two backers. Choose template only (INFO.SM), one backer (INFO.C.SM), or two backers (INFO.CC.SM). Each InfoBoard comes with an anodized marker holder and a dry erase marker. Add your logo to one of our four standard templates or create a custom template unique to your environment. InfoBoard is available with tape mount only. Secure mount with silicone. Do you have custom sizes or needs? Let’s talk. Contact Client Services at 800.777.4310.